On behalf of the Resources for Educational and Allied Consultancy Habitat (R.E.A.C.H. ), Inc. in cooperation with the Sharing Our Caring Foundation, Inc., we would like to extend an invitation to you to attend the 2nd International Conference on Multiple Perspectives on Inclusion, Transition and Disability, Theme: Inclusion in Transition: Integrated Head, Heart and Hands Approach for Success, February 21-23, 2012, in Beijing, China. This year’s exciting and dynamic program will feature a multitude of sessions and workshops designed to enhance the educator’s ability to address the individual needs of all students. The sessions will address topics such as inclusive practices, research-based instructional practices, career development and transition, human rights, and many more areas of focus. The conference will attract participants, most of whom are special education teachers, supervisors, related services personnel, teacher educators, administrators, and students completing their professional training from different parts of the world. 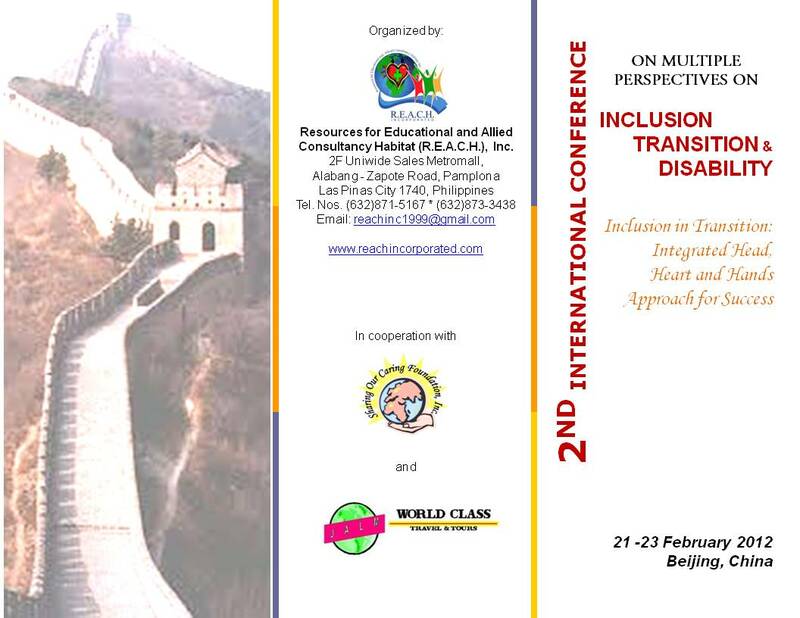 The 2nd International Conference on Multiple Perspectives on Inclusion, Transition and Disability, Theme: Inclusion in Transition: Integrated Head, Heart and Hands Approach for Success will be held at the Holiday Inn Express – Beijing Minzuyuan located at No.1 Building, No.1 Minzuyuan Road, Chaoyang District, 100101 Beijing P. R. China, Tuesday-Thursday, February 21-23, 2012. For registration, abstract submission and program information, please visit our website at www.reachincorporated.com. For more information, please contact Abraham Johann D. Serrano, Conference Coordinator at (02) 873-3438 or (02) 871-5167; email: reachinc1999@gmail.com, ab_serrano12@yahoo.com. Conference Itinerary, Advisory notice on NBI clearance and conference details.